Leonard W. Powers, also known by “Susha”, 74, passed away peacefully on December 20, 2018, surrounded by family and close friends at Southern Ocean Medical Center, Manahawkin, NJ. Born on August 21, 1944, Lenny was raised in Jersey City.In the 1970’s he moved to Beach Haven West NJ, and then to Ocean Acres - Manahawkin in 2013. Lenny held varied jobs throughout his life. In Stafford Township he was a recycle truck driver for over 25 years, from which he retired in 2001. He performed security guard duties at the Forked River nuclear power plant, home building and supply delivery. While still living in North Jersey as a young man, he painted homes, and worked as a milk delivery man. He loved being with and working with people. Educationally, Lenny attended the seminary for a few years, and realized that was not his destiny. He later found that his true calling was as a husband. Lenny is survived by the love of his life Kathleen M. Powers. He is also survived by many nieces and nephews, including Robert Lucas and wife Teri, Tara Akkerman and husband Alex, Joseph RileyJr., Jillian Riley, Jake Riley, Jared Riley, Julia Riley, Mark Lucas and Lenny’s brother Al Powers. 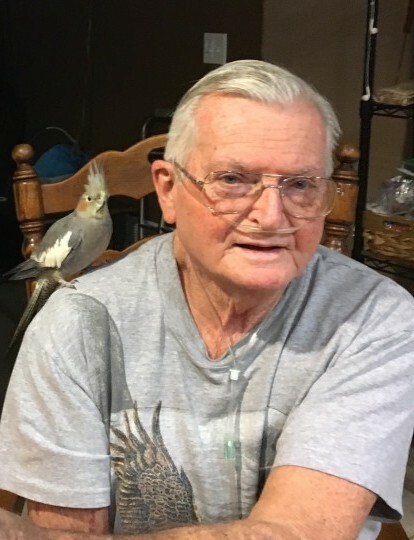 Also surviving are his beloved flock of 13 cockatiels, Pebbles, Chickie, Snoopy, Hootie, Spike, Jazz, Jelly Bean, Ellie, Pumpkin, Buddy, Easter, Peeps, and Twinkle, who will all miss perching on his shoulder and knee while tweeting him their troubles. He was happiest to be an incredibly loving, and supportive husband and good friend to many. Lenny had many hobbies which included his pet birds, traveling, flowers, stained glass, TV, and talking to people. His favorite drink was a Southern Comfort Manhattan. He would appreciate it if everyone would have a drink or two in his memory. He was generous, kind and humorous. He was also known for beingvery stubborn, determined, and perhaps slightly pigheaded, he had a heart of gold for those he loved. A special thank you to Dr Nishi Sahay, Dr Rajiv Sahay, Dr Jeff Lipper, and Dr Mahesh Tekriwal, whose medical care allowed us to have Lenny many more years than his illness should have allowed or wanted. He was also a life long member of the Moose Lodge in Manahawkin. Lenny attended St. Mary’s Roman Catholic Church, Manahawkin, NJ. Cremation is his wish and will be done. He will rest in the future with his parents, Mildred and Joseph, and brother Norman in North Arlington Cemetery, NJ. Visiting hours will be Friday, December 28, 2018 from 2pm to 4pm and 7pm to 9pm with a funeral service at 8:30pm at Maxwell-Tobie Funeral Home, 573 Mill Creek Road, Manahawkin, NJ 08050.